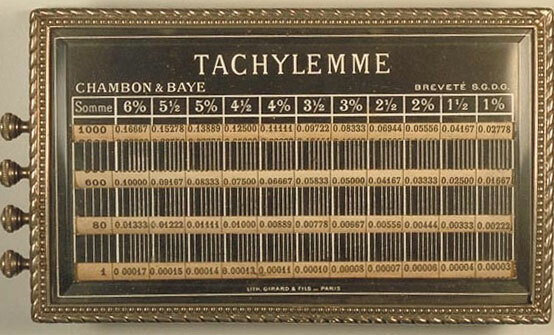 The Tachylemme calculator of the Parisian Casimir-Louis Chambon was patented in 1876 (French patent 115319 for Calculateur mécanique universel) and in 1889 (French patent 198553 for Multiplicateur Diviseur) and was produced and sold in 1880s by his company—Chambon et Baye. Chambon was a holder also of several German patents for calculating devices. 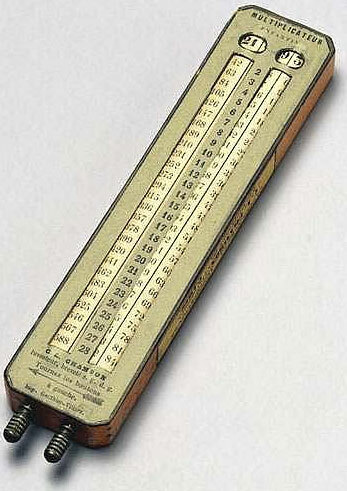 The Tachylemme is a specialized calculator, showing the daily interest on sums of money at various rates. The device was made of wood, paper, metal and glass, with measurements: 175 x 100 x 35 mm, weight: 410 g. It has four printed cylinders: 1-9; 10-90; 100-900; and 1000-9000 so arranged that percentages for every half percent from one to six percent can be read through slits. The total of say 6,216 at 4 percent could be figured by adding the sums shown in the four rows. This arrangement of numerical table on adjacent cylinders has the further advantage of being extendable to certain tables having three entries. It is clear that, if by some means the numbers read from the cylinders can be made to vary according to the values of a third entry, then a triple barème has been achieved. It is this idea that Mr. Chambon most ingeniously put into practice in his Calculateur d'intérêts, which gives the interest payable, for any number of days, on capital sums up to 99,999 Fr. at rates of 3, 3.5, 4, 4.5, 5, 5.5, and 6%. The vertical columns of the table correspond to the first entry, the number of days. As in the Didelin device, the units, tens, . . . , tens of thousands are assigned to the various cylinders, on each of which an endless loop contains the nine lines corresponding to the second entry. Although Chambon's arrangement is most ingenious, and most appropriate to the particular application for which it was developed, it does not allow any great increase in the number of distinct values for the third entry; consequently its use is rather limited. Chambon also introduced similar calculators for the multiplication tables, called Multiplicateur Enfantin (see the lower photo), an automatic calculator (showing multiplication tables up to 50 times 28), and Tachypoly Plasiasme (showing multiplication tables up to 100 times 100), which were produced in 1880s in France.